I recently took a class on rewriting that gave me deeper insights into some of the things I’m already doing, and suggestions to improve others. The first thing discussed was the definition of rewriting. How is it different from editing? Do you have beta readers? What level do they comment on? How low on the pyramid do they really look? Thanks for “digging deeper” into revisions/rewriting. Thanks for stopping by and commenting. Which information did you find most useful? 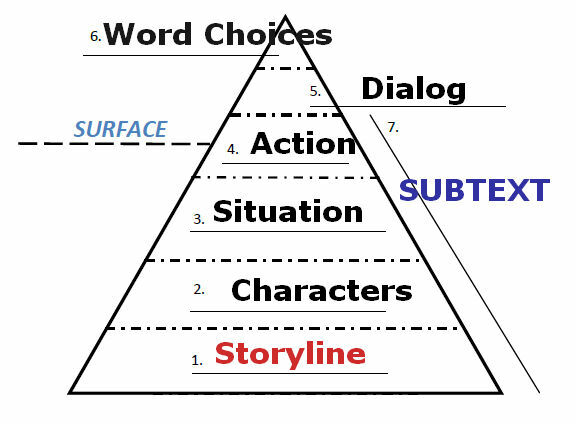 The diagram was helpful and the statement that sometimes the characters and plot need reworking which is a deeper problem than the way the words are ordered.